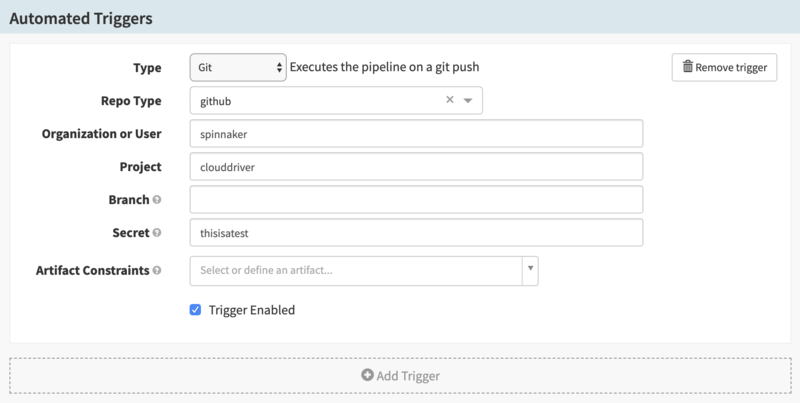 This guide explains how to configure Spinnaker to trigger pipelines based on commits to a GitHub repostory and inject changed GitHub files as artifacts into a pipeline. This functionality uses GitHub Webhooks for delivering messages to Spinnaker, and must be configured to send messages to Spinnaker’s event bus as shown below. If you (or your Spinnaker admin) have already configured Spinnaker to listen to a GitHub webhooks from the repository you plan to publish commits to, you can skip this section. A GitHub repository either under your user, or in an organization or user’s account that you have permission to publish commits to. This will be referred to as $ORGANIZATION/$REPOSITORY from now on (e.g. spinnaker/clouddriver). A running Spinnaker instance. This guide shows you how to update it to accept messages from GitHub. At this point, we will configure GitHub webhooks, and a GitHub artifact account. The intent is that the webhook will be received by Spinnaker whenever a commit is made, and the artifact account will allow you to download any pertinent files. Follow the GitHub webhook configuration. Follow the GitHub artifact configuration. to apply them in Spinnaker. We will need either an existing or a new pipeline that we want to be triggered on changes to GitHub artifacts. If you do not have a pipeline, create one as shown below. Once you have your pipeline ready, we need to declare that this pipeline expects to have a specific artifact matching some criteria available before the pipeline starts executing. In doing so, you guarantee that an artifact matching your description is present in the pipeline’s execution context. If no artifact for this description is present, the pipeline won’t start. Now to configure the artifact, change the “Custom” dropdown to “GitHub”, and enter the File path field. Note: this path can be a regex. You can, for example, set the object path to be folder/. *\.yml to trigger on any change to a YAML file inside folder in your repository. 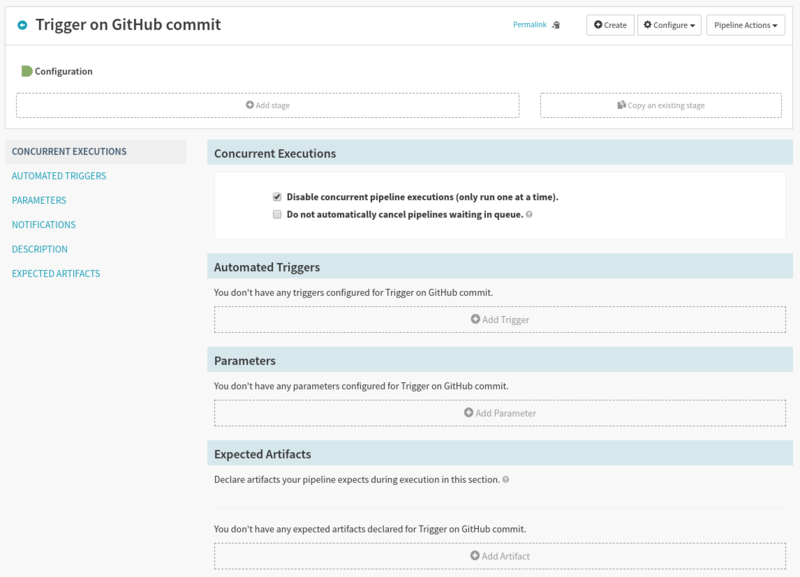 By setting the Expected Artifacts field in the trigger config, you guarantee that git webhooks will only trigger this pipeline when an artifact matching your requirements is present in the commit. If you add or modify a file matching your expected artifact to the configured repository, it should execute. If it doesn’t, you can start by checking the logs of the Echo service.